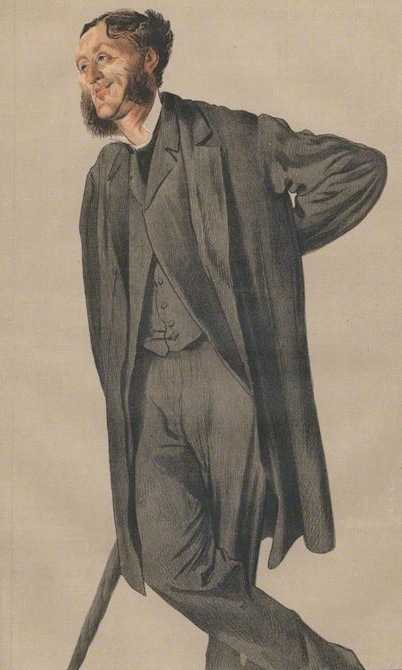 A teasing caricature of Matthew Arnold in 1871, during his early years in Cobham, by James Tissot. He wrote with perpetually fresh wonder of the beauties of his own garden — its roses, jasmine, camelia, azalea, rhododendron, marigolds, dahlias, veronica, geraniums, pampas grass, laburnum, brooms, hollies, laurels and so on. He had a kitchen garden, too, and complained if his strawberries and potatoes were not doing well, while showing off his produce when it flourished. For example, he sent his wife Flu (Frances Lucy) to Lady Ellesmere nearby with a fine Duchesse pear, and was gratified to hear that their titled neighbour, who was actually a Countess, planned to show it to her gardener, as proof of how much better it was than her own pears. He spread nuts on the lawn for the squirrels, made friends with a jackdaw, and fretted about the effects of high winds, frost, thaw, rain and lack of rain. His love of nature in his Surrey home remained "strong and operative" until the very end ("Wordsworth," 710). 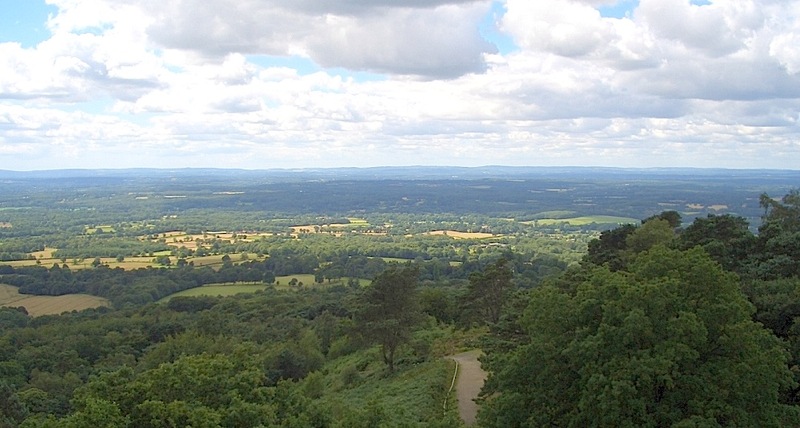 Left: Leith Hill, the highest spot in the county, which Arnold loved to visit. In 1864, his friend William Evelyn installed a stairwell in the eighteenth-century tower, so that people could admire the view from the top. Right: The view from the top. Arnold loved the rest of the county almost as much, taking a personal pride in its many beauties. He would walk over to the Burwood area, on the edge of Walton, finding it especially pleasant to walk the dogs there after a day in London, and revelling in the browns and golds of autumn in the ferns and chestnut trees along the Walton road. He went boating on the Wye, walking on Box Hill again, and fishing at Wotton again. 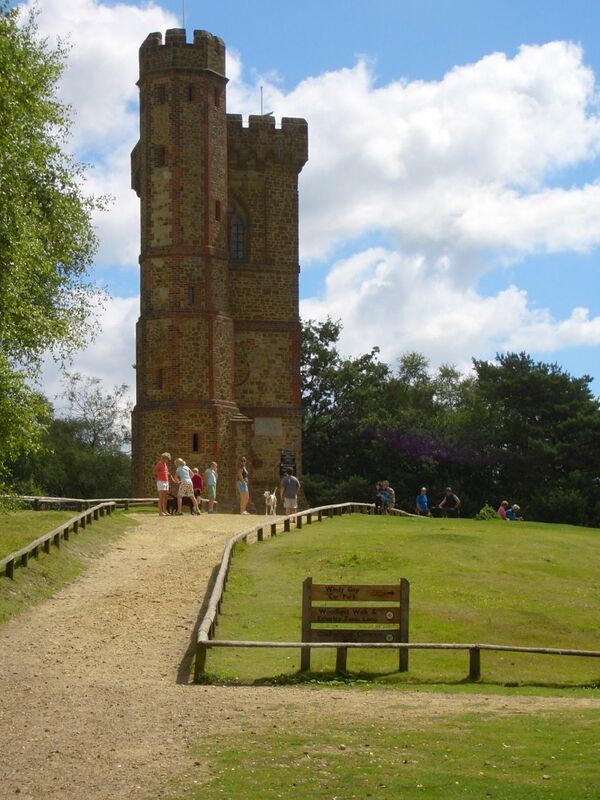 He loved Leith Hill, Ewehurst windmill and the marvellous views from that area. In the summer of 1882, he stood as godfather to one of the Evelyn children, and wrote afterwards, "I was never so struck with the beauty of that country; the parallel foldings, of which the Wotton folding is one, running up into the greensward knot of Leith Hill, are inexhaustible in beauty." Together with Lady de Rothschild, who shared his interest in botany, he went to look over John Evelyn's old herbarium — "the plants wonderfully preserved still, and his notes to them full of matter" (LL V: 220). How lucky he was to have that opportunity! 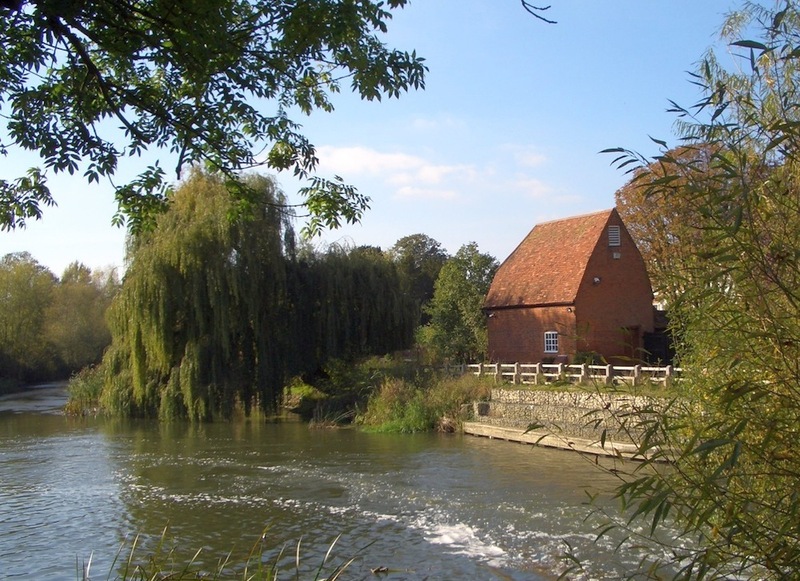 The old mill at Cobham on the River Mole, which flows on through Painshill Park, past the lakewhere Arnold liked to skate. On such outings, Arnold was invariably with or visiting friends, for he and Flu and their still unwed daughter Nelly were not at all "the hermit and hermitresses of the Mole" as he liked to joke. The Ellesmeres, Lady de Rothschild and the current generation of Evelyns were not even the most exalted of his friends among the landed gentry. He was on visiting terms with the famous Surrey Lovelaces, whose "fantastic" house, Horsley Towers, left him almost at a loss for words (LL 4: 308). He was a friend of the Buxtons (the widow and children of the MP, abolitionist and amateur architect Charles Buxton), visiting their only somewhat less eccentric house, Foxwarren Park, off the Byfleet Road. He was also invited to nearby Claremont, which was by then the home of the Oxford-educated Duke of Albany, Victoria's youngest son. There he chatted to the Duchess of Albany (whom he called "the princess") about schools, and dined with the most important people of the age, like Sir Richard Wallace, whose widow bequeathed his collection of paintings, fine antiques and so on to the nation — London's world-famous Wallace Collection. He invited people in his turn, offering to meet Henry James at Walton Station off the 5.25 from Waterloo: "I am bent on getting you to visit me in my rural Grub Street," he wrote (LL 5: 38). He never succeeded in this, but there were other representatives of the literary world right on his doorstep: his publisher and friend George Smith lived first in Walton then in Weybridge, both very close by. All this was on top of his busy social life in London, for Arnold, like most Surrey people, was often in town. He enjoyed being at his club, the Athenaeum, and the Arnolds liked to escape part of the winter by renting a place in Belgravia again. Yet their hearts were really in Surrey now, and they looked forward eagerly to being back there in the spring: "the 1st of April when we return, will be a joyful day indeed," he wrote on 3 March 1887 (LL 6: 261). Oxford could not tempt him any more, and he refused to stand for Professor of Poetry for a third time. The chance of being the Rector of St Andrew's University failed to draw him to Scotland, either. And when he did have to leave his home for long periods, especially on the two trips to America to give lectures and visit his daughter Lucy there — she married a lawyer whom she met on the first trip — he missed it terribly. "The kindness and goodwill of everybody is wonderful, and I cannot but be grateful for it," he wrote to Fan early in the first trip (LL V: 313-4), but towards the end confessed, "the desire to be back rises sometimes into a passion" (LL V: 389). He certainly had no desire to move house again. And be as if thou ne'er hadst been. To travellers on the Portsmouth Road. Mark'd with a stone, thy last abode! "Geist's Grave" is hardly great poetry, but it provides a useful antidote to the view of Arnold as a aloof and intent on edification and the dissemination of culture.